DH & myself at Philly’s Cathedral of Sts Peter & Paul, 2004. I’m pretty sure I didn’t just laugh: I outright snorted in derision. It was in the very late 1990s, maybe very early 2000s. My husband, my “practicing agnostic physicist,” my skeptical partner was driving us around our old neighborhood in Philadelphia. I don’t even remember where we were going, but I’m pretty sure it was not a day we were not driving to one of our many doctor appointments. The subject dropped–for years, really. It’s not hard to imagine why, given my response to his question. Those were also the years of trying to find help for our infertility and getting nowhere with the traditional medical establishment. We came to marriage, two broken people from two broken homes. The odds were so against us. But from the moment I met the man who would become my husband, I saw in him a certain humility and tenacity that I’d never found before in another human soul. So while he might not have had any faith in any god besides science and provable truths, I knew I had faith in him. But those years were hard and surely tested that humility and tenacity in ways we never could have expected. Empty arms are a heavy burden. We set our sights on adopting from China, a dream I’d had since the time I was in third grade, but I was not yet 30, the age China required of their adoptive parents. We waited. During that wait, for our fifth wedding anniversary, we decided to take a road trip. We drove in our little red car up to Montreal. At a little hole in the wall Greek place, we had the best sangria and tzatziki we’ve ever tasted and watched the sun set. The next day we did some walking and checked out the Shrine of St. Anne de Beaupre. We didn’t do the traditional pilgrimage, but we picked up a holy card and we attended Mass together in French. He understood neither the Mass nor the French, but as with many other things that have happened in our shared life, I could follow along well enough to keep us both from embarrassing ourselves. That was September. 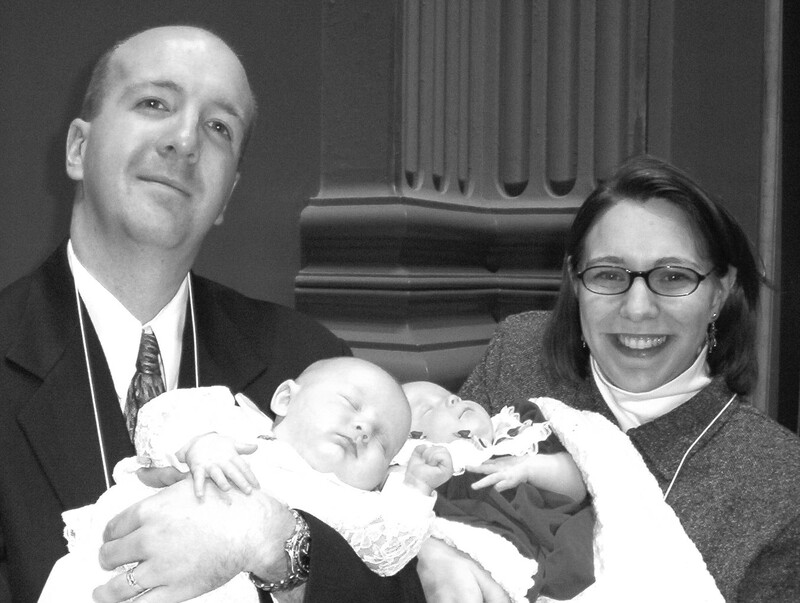 I prayed for an easy wait for our adoption, for enough money to make it happen, for patience. We could start the process as early as six months before my thirtieth birthday. That would be the following May. We waited. The first weekend of May, 2003, I was taking half of Thursday and all of Friday weekend off, first to go to a dentist appointment and then to prepare for a writers conference that Saturday… or so I told my office mates. It wasn’t a lie, per se, because I did have a dentist appointment, and I was going to prepare for a conference, but I also was going to spend most of Friday putting in our orders for our birth certificates and setting up appointments with a social worker so we could get our application together and submitted exactly on my half birthday at the end of the month. There was one problem, though, with the dentist appointment. My period was missing. I was certainly no stranger to long cycles (see above, re: infertility), and I’d been having my usual spotting and “warning cramps.” So in the wee hours of that Thursday, I woke up with a full bladder and took a pregnancy test, just so I could reassure my dentist that there was no chance I was pregnant and they could go to town on my X-rays. Alas, that reassurance wouldn’t be happening. I tiptoed back into our bedroom, test in hand, and gently shook my husband’s shoulder. He woke up. Shock mingled with joy. The next day on my lunch break, first I cancelled my dentist appointment then called my regular doctor. I said I had a positive home pregnancy test, but I was having some bleeding and cramping. They called me in for a blood test just to get a better idea of what was happening. The next day, when they called with my results, they said my HcG levels were 17,655, which was nice and high and indicative of a healthy pregnancy. I drove down to the hospital where my husband worked and he met me in the ER shortly after I was brought back. We waited. They wheeled us up for an ultrasound. “Have you had your HcG level checked?” the technologist asked. The exam ended. They wheeled me back down to the ER. We waited. We laughed. Then we went and got hoagies for dinner. I was, after all, eating for three. St. Anne de Beaupre, whose shrine we had visited on our anniversary trip, is a title for the mother of Mary. The grandmother of Jesus herself experienced the long wait for a child, the heavy burden of empty arms. Through her intercession, barely requested, God brought not one soul but three into the Body of Christ. Apparently Jesus loves to give His Grammy stuff, too. I often think of this story and how God worked a miracle to open the heart of my husband to the truth and beauty of the Catholic faith. However, for the first time I’m appreciating how my own heart has been stretched as well. I am writing this in the minutes before we all go down for an afternoon nap so that we can attend Easter Vigil Mass: all five of us plus my long time BFF, another convert to Catholicism. It’s going to be the longest Mass in a whole world of long Masses. And we’re taking three kids, one of whom is a very wiggly, chatty five year-old. If we get through this, it’ll be a miracle. That’s okay. It won’t be our first. From our family to yours, a Blessed Easter. This needs a tissue warning Erin!!! So many answered prayers … what an awesome God we have!! p.s. you are a better woman than I , as I am going to the vigil but leaving the kids home (course mine can babysit themselves and their 9 year old sister, who coincidentally is adopted from China). HAPPY Easter!! How amazingly beautiful that God used your pain and gave you blessings in return. Kind of an easter theme, don’t you think? From the pain of Christ’s sacrifice we’ve been given the blessing of salvation. Thanks for sharing Erin. The last time I was at an Easter Vigil (before last night) was before you and I ever met. I was feeling bad (as a Catholic) that I was so reluctant to go this year. My daughters friend was baptized last night. Two hours is a long time for a seven year old who is up past her bedtime. It was a beautiful Mass. In another thirty years I think I may go to one again. Happy Easter! He is Risen! Before we met?!?! That was REALLY long ago, lol! Don’t wait 30 years, though. Kids love staying up and will do anything to get away with it–even go to church. Wishing you a blessed Easter Season. Beautiful story, and ditto on the “tissue warning”! Just happened on this and…wow! So. Many. Feelings! I was just received in confirmation this Easter Vigil and there was a level of beauty there which I didn’t fully expect. I should say I am not a convert, nor a new Catholic. I am a cradle Catholic who somehow got “lost in the shuffle” as my mother says, and never got confirmed. Now in my mid-30’s with two growing children I decided it was about time, and what a difference it has made! I was embarrassed about it at first, but there was something so affirming (if not backward) about having my nine-year old daughter (the 6yo was at grandma’s) and my husband share that moment with me. My husband too, well – I wouldn’t say he’s agnostic, a theist sure, but kind of on the fence about Catholicism. He is not baptized, but comes to mass every week, and my one dream is for him to convert! We had a reception after the vigil, and many parishioners told my husband that next year he needs to complete RCIA, so we can all have cake after vigil (a special gift for those new entrants to the church) What a delight it was to read this post!! And a delight to read your comment! Thanks for stopping by. I’ll surely keep your husband and family in my prayers. God’s timing is perfect.